According to reports, talks taking place between the former chiefs of staff for an alliance in next Knesset elections. In recent days, advanced contacts have been taking place over an alliance of former chiefs of staff Benny Gantz and Moshe Ya'alon, with Gantz heading the party for the 21st Knesset, according to Hadashot 2. 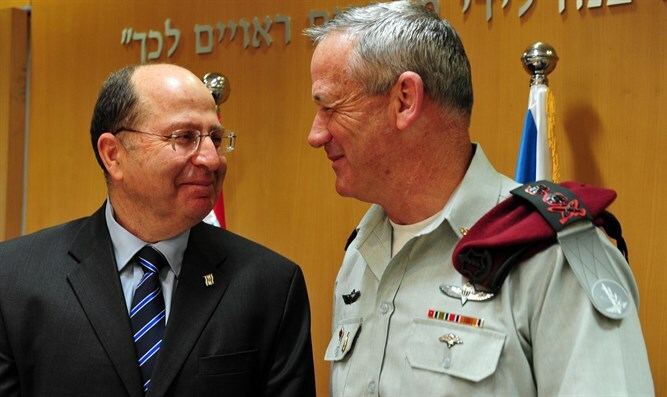 According to the report, the list of the chiefs of staff will seek to provide a response to security concerns, with Ya'alon's inclusion aimed at avoiding a left-wing image for the party. Channel 10 reported that Gantz will bring with him to the list people of action who can help behind the scenes, including educator Chili Tropper and Itzik Kreis, former chief medical officer and current director of Sheba hospital. It was also reported that Ya'alon and Gantz have initial understandings about merging lists after the two register their respective parties separately. Both candidates preferred not to comment.